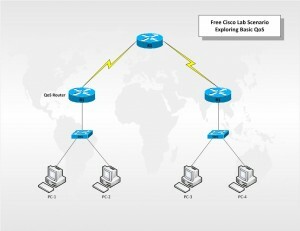 In this lab scenario you will learn how to configure and apply Quality of Service (QoS) on a Cisco router to mark EIGRP protocol traffic. You will also learn how to generate interesting traffic and use packet Tracer simulation mode to monitor and identify QoS marked traffic. QoS (Quality of Service) refers to a broad collection of networking technologies and techniques. The goal of QoS is to provide guarantees on the ability of a network to deliver predictable results. Elements of network performance within the scope of QoS often include availability (uptime), bandwidth (throughput), latency (delay), and error rate. QoS involves prioritization of network traffic. QoS can be targeted at a network interface, toward a given server or router’s performance, or in terms of specific applications. A network monitoring system must typically be deployed as part of QoS, to insure that networks are performing at the desired level. QoS is especially important for the new generation of Internet applications such as VoIP, video-on-demand and other consumer services. Some core networking technologies like Ethernet were not designed to support prioritized traffic or guaranteed performance levels, making it much more difficult to implement QoS solutions across the Internet.